Well if you are like me, you have heard this word ‘Blockchain’ bandied about. You have read and heard so much about it in the news yet you wonder if you really do understand it. It can seem that everyone is talking about blockchain and ledger technologies, but the truth is most of us are not yet up to speed, just like me! What Blockchain is and ‘could be’ is fuelling industries the world over. Everyone seems to be seeking possibilities. So, what are some ‘Blockchain Basics’? In this space, I along with a colleague, will try and explore an understanding of the technology and possibility called Blockchain. We invite you to join us. 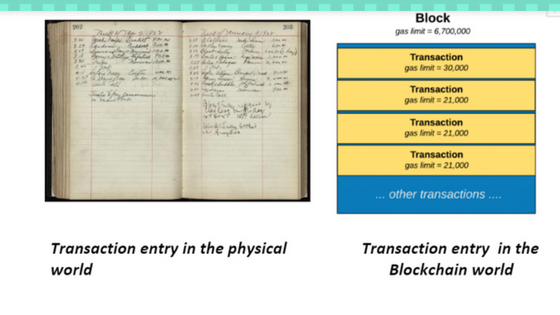 We will attempt to understand Blockchain and it’s many terms in as simple a manner as possible, through this series. ‘What is Blockchain’, is a good place to start. In a nutshell, Blockchain is; A permanent secure digital distributed ledger. Am sure that meant nothing! It didn’t when we read it the first time and was trying to understand what Blockchain was about. Let’s see if an example makes it any better. Something we can relate to, an excel sheet? Think of Blockchain as an excel sheet which is open on all computers in the network. Any changes being made to the excel will be visible to all in the network as it is being made. It hence always is transparent and in a state of consensus. To be clear, it is not one excel in a central location shared by hundreds of computers. It is hundreds of copies of the same excel stored on hundreds of different computers across the world. It also makes the data secure. Think of a hacker who has to erase the data from hundreds of systems to alter anything; earlier all he had to do was change it on ‘one’ master system. Let’s try another example exploring why the world is falling over itself imagining the immense possibilities Blockchain holds. Let’s assume that ‘you’ have a file of financial transactions on your computer. Three accountants have the same file stored on their computers. 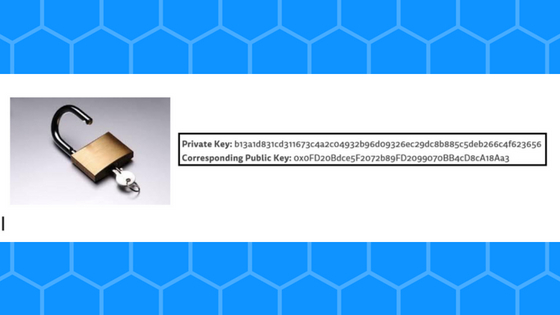 As you make another transaction buying something, your computer sends an email to each of them informing them of the transaction. All three accountants rush to be the first one who will verify if the transaction is correct and you can afford the ‘buy’. 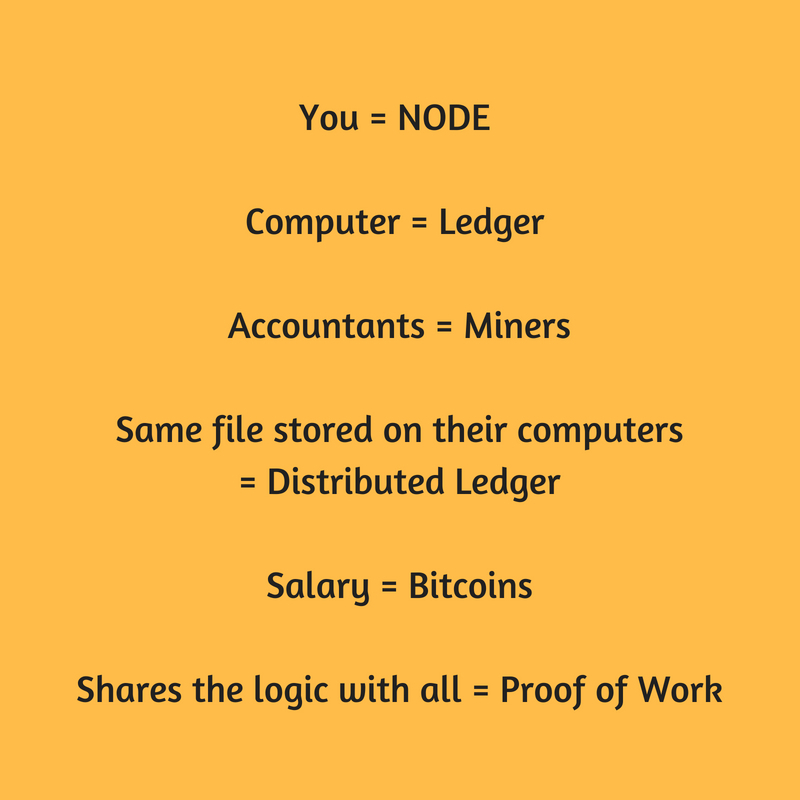 The first one who verifies the transaction shares the logic with all the other accountants and gets paid a salary. If the other accountants agree that the transaction is correct and you can afford it, then everyone updates their excel sheet automatically. This whole concept is nothing but Blockchain Technology. If you wanted to indulge in tech-geek speak, here is your way to do it. 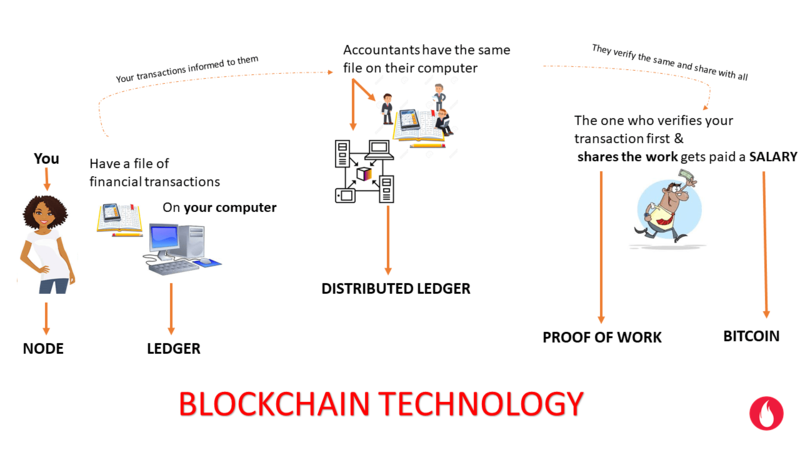 Until then here are some links for you to explore what Blockchain is, one is a video featured on OWL (Our Work is Learning) Newsletter which explains Blockchain to a toddler and professional. What do you think? Your comments would be great to help evolve an understanding. Thanks much. The world has a ton of problems. And sometimes, you cant help but thank God that some of them are there. For they make living and life worthwhile. The quest for solutions may not lead a person to solutions always. But invariably the learning that comes from such quests are far more important than the solutions themselves. But on that topic, another time. Another post. But pause for a moment and wonder at what kind of creative solutions are needed to solve the problems that we face today? Not at all times can we have a ‘total revamp’ or ‘blue sky’ technology as an answer to our problem. Yes, it would be good and in some cases pretty much necessary too. But most cases, as in life, we do not get presented with the cleanest of slate to restart from scratch. Yet, the solutions that ordinary people come up in their lives are both incredible and ‘just what is needed’ from what is already there. Take a look at these one minuter videos that have been around for a while now, but always never fail to inspire every time I view them! May I invite you to pause and think about organisational equivalent of problems like these. And solutions found. Large organisations boast of such a fabulous diversity and depth of knowledge and talent , that it is a shame that much of it goes under leveraged! If you are a leader in a large organisation, when was the last time you looked within in the quest for answers to problems you are confronted with, before dialing for help outside? Large organisations and their talent can be better leveraged. Lets say you are seeking a solution to say, ‘how best to design a workshop’ (an example I choose, because of frequently being faced with it). How many times have you thought of asking the folks in sales ? Or maybe Marketing ? Or administration? Or manufacturing? I mean, anybody in the building. The answer may not be directly something that could help, but it sure is going to be something that I could build on. People may not know a thing about learning design, but they know the organisation pretty well! And when structured approaches to seek their thought and apply it well are sought, the solutions work like magic. What perhaps is required is a problem that is not only large enough, but for a which an answer is sincerely sought. Combined with a diversity of intelligent minds some of who have are seeking those answers and buffeted by some quick first steps! Leaders and managers who have the ability to entertain and examine ideas objectively without necessarily embracing them, are an important component of such collaborative on the ground innovation. More such managers in a system, more leveraging and energising that comes by the organisation! Now, now, does it not have challenges? Ofcourse it does. The solutions evolved sometimes aren’t the best in class. They may not have the gleam of a finished product from an assembly line. But they are precisely that. They aren’t from an assembly line! They are put together! The other challenge with such a solution is the fact that it may not have the best of whats in vogue outside of the organisation. That needs to be consciously built. Knowledge of best practices and latest research is so available on public platforms that if you are determined to get it, there can be no stopping! Having worked on several such projects and veering to believe that organisation intelligence and talent needs to be grossly better leveraged and makes life easier on several counts! At one level a non-assembly line but the most appropriate solution is found. At another, far deeper level, it energises the organisation no-end! People who find themselves valued and whose views and opinions are sincerely sought do not mind giving an extra bit to help the project through! Plus, once all ideas are incorporated, guess what, change management and implementation is held by a far wider set. At yet another deeper level, could you think of any better way of cross pollination of ideas and forming of relationships between diverse groups who otherwise maybe quite oblivious to the other’s existence, leave alone work and problems? Organisations give an arm and a limb for something like that! The next time you have a problem that you want to solve, look inside around. Sometimes, the people standing very close to you can have an idea or two that perhaps no can come to you with! Don’t get me wrong. External consultants have expertise and specialisation that are hard to match. It is important to build that expertise on the foundation of assimilation of internal strengths as well! I have cherished working with several external consultants. And all of them who have left an imprint are ones that began by leveraging on diverse thought streams within the organisation! Me & my brother grew up watching Boris Becker deliver his boom boom serves and Mats Wilander execute his stylish two fisted backhands with ease. We enrolled in a tennis academy and ended up with a coach who disappointed us no end! For one full year (or so it seemed, it definitely was a very long period of time) his standard bark was: “Watch the ball”. If he caught us playing on points, punishment runs ensued. Same with playing fancy shots. If we picked up footwork or two from TV, his response was standard: drop the racquet and go take a run. We had no option but to get used to him. Eventually, we did get used to him. And we had no other option but to ‘watch the ball’. What we had no idea about was this : that we perhaps were picking up the most fundamental habits of watching the ball, getting clean ground strokes and volleys. We didn’t realise that we had made rapid progress on the court. For, he would never allow us to play a competitive match against each other. “Watch the ball. Aim for where you want to hit and then hit it there”. That was his refrain. We were free of competition. We were free flowing. We were playful. After about a year of just tapping the ball and getting the footwork and strokes right, he finally relented. Much like an upset father handing over the keys of his prized car to just-become-old-to-drive son. And allowed us to play games on points. 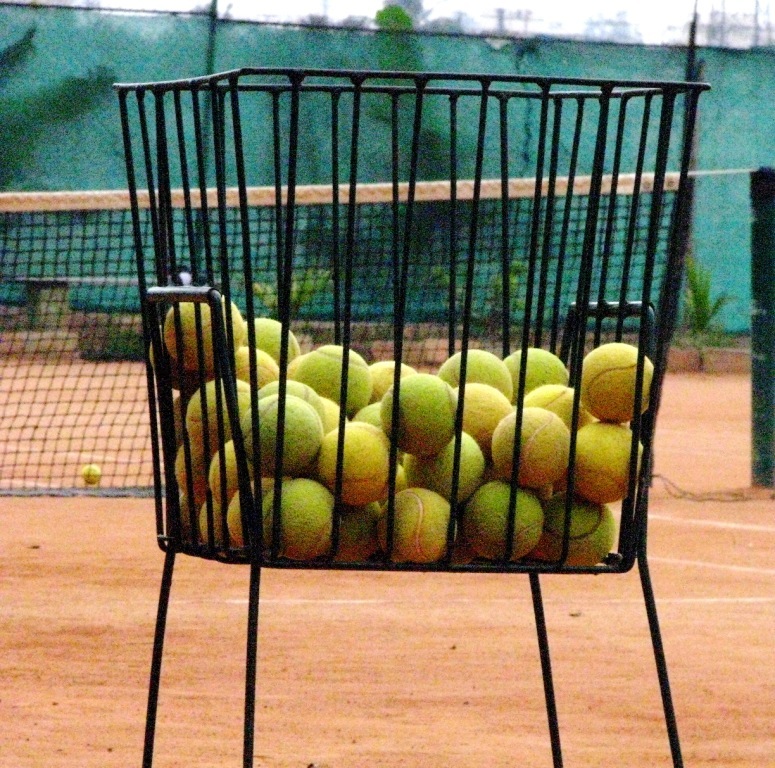 Very soon, we started playing competitive tennis at club and district level. We surprised people and won a heap of matches and then carried on with life. Tennis didnt feature there. Many many years later, at a corporate picnic, I picked up the racquet to tap a few balls. In my mind, I could clearly hear him shout ‘watch the ball’. I hadn’t touched a racquet in a long while, but I perhaps had one of the cleanest ground strokes amongst all the folks there. Far better than the folks that were ‘regulars’ at the game! The next three hours of awesome tennis were in a state of seamless flow! I couldn’t have been more thankful for all the hoarse ‘watch the ball’ hisses! For it taught me near lessons of ‘learning the basics well’ for a lifetime. You see, the basics can get boring. But, the basics are the only aspects that matter in the beginning. Mastering the basics will eventually get you the game. It is so tempting to get on with the ‘game’. But the best coach / teacher/manager is the one who helps in keeping that temptation in check and focuses on getting the basic habits in place. Delivering results, by ensuring good habit formation. For, it is in the formative years that work habits are formed. The right habits are the ones that make a difference eventually. Formative years are so very crucial that the role of managers who manage people in their first jobs assumes great importance. There is their chance to shape thought and action and thus, in a way, shape lives. Sow the right habits. Managers who manage students who are crossing over to corporate have a great responsibility of not only delivering results but also help good habits take shape for a lifetime. Students taking up corporate jobs, often want to do the shiny thing. Strategy and stuff sitting out of corporate offices! Things that have been picked up from the text books. Much like the awesome cross-court shots of Mats Wilander that we picked up from TV. In retrospect, it is clear now that what we had to do as a beginner was to watch the ball and get the footwork right! The competitive game came later. And it came without effort and stayed on for a long time. Almost automatically! Developing good work habits. The power of focus. An understanding of what constitutes success can all be learnt. All of this is so key to strategy building. All of these are learnt early in work life. Good Management Trainee programs have people sweating it out in the field as their hallmark. That builds character and a sense of purpose. If you are a management trainee slugging it out, you are lucky. If you are a manager of one of these lucky blokes, get them to watch the ball, so to speak, while delivering results. Assimilation of what happens on the field needs to happen when the mind is fresh!